1 ~ Bring Almond Milk to the boil over a hob and once simmering, add the Flora Vegan Margarine. Remove from the heat. Stir until completely melted and then allow to cool. 2 ~ Combine the flour, yeast, sugar, salt and spices in a large mixing bowl. Make a well in the centre and pour in the cooled milk mixture, immediately begin to combine with a wooden spoon until it creates a sticky dough. Tip out of the bowl onto a surface which is lightly dusted with flour. 3 ~ Work the dough by stretching it back and forth on the surface for 5 or so minutes or until smooth, stretchy and springy. Shape into a ball and put into a large, lightly oiled mixing bowl. Cover with a tea towel and leave in a warm spot for roughly 1 hour or until doubled in size. and leave to for another hour. 5 ~ Line a large baking tray with greaseproof paper. Return the dough to the surface to give it another kneed, removing the air. Divide the dough into 12 similar sized portions. Roll each portion into a ball before arranging the buns on the grease proof paper, leaving a couple of centimetres between each one. Cover with lightly oiled cling film and leave for another 45 mins. the buns. Transfer to the middle shelf of the oven and bake for 15-20 mins or until a nice golden brown. 7 ~ Finally, gently heat the jam in a small saucepan over a low heat or in short blasts in the microwave to loosen. Once the buns are out of the oven, brush the warm jam over the tops before setting aside to cool a little before eating! With Easter on the horizon, I’ve linked up with Guyana’s amazing rum brand El Dorado to create these utterly indulgent, super chocolatey truffles that are guaranteed to get friends and family hopping with happiness. An elegant multi award-winning rum which is available from Waitrose, El Dorado 12 Year Old typifies the smooth mellow sweetness of Demerara Rums from Guyana. A blend of specially selected aged rums, the youngest being no less than 12 years old – it is aged in old bourbon oak casks. While this rum is great when sipped straight, on the rocks, in a classic Mai Tai cocktail or in a Rum Old Fashioned, I just couldn’t stop myself from using it to create these boozy balls of joy. The combination of silky coconut milk, rich dark chocolate, gooey dates and aged rum is a match made in heaven making these truffles the ultimate chocolate treat this Easter! They are also ideal to make in advance as you can store them in the fridge for up to two weeks. Pit the dates and place in a bowl. Cover them with the El Dorado 12 year old rum and let them sit for at least 30 minutes. In a small pan add in the coconut milk, dark chocolate, maple syrup and vanilla bean paste. Keep whisking the mixture on a very low heat (to prevent from burning and sticking to the bottom) until the chocolate has completely melted and you have a silky and smooth mixture. Add the soaked dates + the rum to a food processor together with the coconut milk chocolate. Add in the cacao powder and blitz until you have a smooth, thick and sticky kind of paste. You might need to scrape the sides of the food processor a few times and then blitz again. Place the truffle dough into the fridge to set for at least 2 hours or until it’s almost solid. Once the mixture has firmed up, using a tablespoon start to roll into a balls. Roll the balls between your hands and cover them in a coating of your choice. Store the truffles in a an airtight container in the fridge for a couple of weeks. Chop the tempeh into large cubes. Add some boiling water to a pan. Add the tempeh and boil it for 15 minutes. Place all the ingredients for the curry paste into a small food processor and blitz until you have a fairly smooth paste. Add the coconut oil to a large pan, once hot add in the curry paste. Cook for 4-5 minutes and keep stirring to prevent from burning. Add in the chopped sweet potato and tempeh. Pour over the coconut milk and mix everything together. Add in the keffir lime leaves. Put the lid on and cook for 25 minutes until the potatoes are soft but not too mushy. Serve while still warm with some rice and chopped coriander. Chop the tempeh into large cubes. Add some boiling water to a pan. Add the tempeh and boil it for 15 minutes. While the tempeh is cooking in a small bowl mix together all the ingredients for the marinade until you have a smooth consistency. Drain the tempeh cubes and pat them dry with a tea towel. Mix the tempeh with the marinade and make sure all the cubes are well coated. Spread them a baking tray lined with some parchment paper and bake in the oven at 180 degrees Celsius for 20 minutes. Serve with rice, veggies of your choice and enjoy! Add a dash of oil to a large pan and once hot add in the chopped onion. Fry the onion gently for 3-4 minutes until it starts to caramelised. Add in all the spices + the garlic cloves. Cook for another minute and continue stirring to avoid burning. Add a dash of water to prevent from sticking. Add in the drained chickpeas, coconut milk and tinned tomatoes. Mix everything together, add bit of boiling water just to enough to cover the chickpeas. Put the lid on an cook on a low heat for 20-25 minutes. Serve with some rice and veggies. Add a dash of oil to a large pan and once hot add in the chopped onion and chopped carrot. Fry the onion gently for 3-4 minutes until it starts to caramelised. Add in the garlic cloves + smoked paprika (if using). Cook for another minute and continue stirring to avoid burning. Add in the chopped potato, frozen vegetables and drained butter beans. Cover with boiling water and add in the veggie stock. Put the lid on and cook on a low heat for 20-25 minted. You want to makes sure the potatoes are really cooked through so they go all mushy and makes the soup creamier. Serve straight away and enjoy! Add a dash of oil to a large pan and once hot add in the chopped onion and grated carrot. Season with salt & pepper.Fry the onion gently for 3-4 minutes until it starts to caramelised. Add in the garlic cloves. Cook for another minute and continue stirring to avoid burning. Add in the tinned tomatoes. Cover with a lid and cook on a low heat for 15-20 minutes. Cook the pasta according to the packet instructions. Just before serving add in the frozen peas and cook for another minute. Drain the pasta and drizzle with some olive oil to prevent from sticking. Stir in the sauce and enjoy! Add a dash of oil to a large pan and once hot add in the chopped onion.Fry the onion gently for 3-4 minutes until it starts to caramelised. Add in all the spices and the garlic cloves. Cook for another minute and continue stirring to avoid burning. Add in the rinsed lentils, coconut milk, chopped potato and tinned tomatoes.Add in some hot water until everything is covered. Put the lid on and cook on a low heat for around 25 minutes. You want to make sure you check it from time to time as the lentils will gradually absorb the water so you might need to add a bit more as you go along. Season with salt and when it’s all mushy and creamy it’s ready! Serve with some rice and enjoy! Despite the Shrek green colour this soup is utterly delicious, I promise! The potato makes it creamy and filling and the peas adds a lovely sweet flavour perfect to counter balance the slight bitterness of the spinach. I love adding a bit of miso paste as it really adds lots of flavour, I couldn’t recommend more to invest in a jar or miso paste, it really goes a long way! I also like to add some nutritional yeast for that “cheesy” tone but If you don’t have it you can leave it out. To a large pan add in the oil. Once hot add in the chopped onion and celery. Fry the onion and celery for few minutes until the onion starts to caramelise and become translucent. Add in the minced garlic and cook for another minute. Add in the chopped potatoes, stock cube and miso paste. Mix everything together and cover with boiling water. Put the lid on and cook for around 20 minutes until the potatoes are soft. Add in the frozen peas, nutritional yeast (if using) and the spinach and cook for another few minutes. Adjust with salt & pepper. Using a hand blender or a normal blender, blend the soup until smooth and creamy. It’s totally delicious as it is but if you want to add creaminess you can add a dollop of coconut yogurt. Since I came back from Thailand and Cambodia I have been obsessed with fresh spring rolls, they are so easy to make, packed with veggies, light but delicious at the same time. You can really go crazy with the veggies you want to use, I went for carrot, lettuce and Thai basil but peppers, purple cabbage or avocado will work too. The tofu and the rice vermicelli makes them more filing and they also add different textures. The peanut sauce is seriously to die for and takes this dish to the next level! Start by cooking the tofu. Wrap the tofu in a tea towel and place something heavy on top, like a pan and some books on top. Let it sit like that for 10 minutes until you can see quite a bit of water coming out. Once pressed cut the tofu into small batons. Add the coconut oil to a pan and once hot fry the tofu sticks. Add in the soy sauce ad cook for 5-10 minutes until the tofu is slightly browned. Leave it onto one side. Make the sauce by simply mixing all the ingredients together until you have a creamy and silky consistency. To assemble the roll: dip the rice paper into some cold water for literally 30 seconds (if you leave it for too long it will be too sticky and impossible to handle) Lay it down on a chopping board or large plate. Place a bit of carrot, lettuce, basil leaves, rice noodles and tofu on the part of the rice paper close to you. Roll the roll by folding as tight as you can and also fold inwards the ends. Repeat the process until you have finished all the fillings. Make sure not to overstuff the rolls as otherwise the rice paper might break and the spring rolls will end up too big. With a very sharp knife cut the spring rolls in half and serve them with the peanut sauce. If you want to switch up a little bit from your traditional sweet pancakes these bad boys are for you! They are super simple, packed with veggies and really delicious! The chickpea flour makes them really filling, high in protein and fibre. Make sure to serve these pancakes while they are still warm, they tend to go a bit hard once cooled down. If you have any leftovers pop them in the the toaster for few minutes before enjoying them again! As with the sweet pancakes make sure you go all out with toppings!I love topping them with sliced avocado, coconut yogurt and pan fried mushrooms but any roasted veggies you have on hand would work too! 1/2 cup of flour of your choice – I have used spelt flour but gluten free flour will work as well. I a large mixing bowl add in the chickpea flour, spelt flour, nutritional yeast, salt & pepper and bicarbonate of soda and give it a good mix. Gradually pour in the water and mix with a whisk to avoid any lumps. Keep whisking until you have a smooth and thick batter. Leave it onto one side. Add a touch of oil to a large frying pan and add in the chopped spring onions and carrots. Cook for 1-2 minutes until the spring onions start to soften then add in the grated carrot and fry for another 2 minutes. Remove the veggies from the pan and add them to the pancakes batter. Mix everything together. Add another bit of oil to the pan is it’s too dry and start to cook the pancakes adding about 2 tablespoon of the batter for each pancakes. When they start to form bubbles on top flip them and cook them on the other side. About 2 minutes each side. Repeat the process until you finish all the batter. Serve them straight away with some avocado, tomatoes, pan fried mushrooms and coconut yogurt. This recipe has been one of my favourite midweek dinners as I absolutely love how is bursting with flavours and different textures. 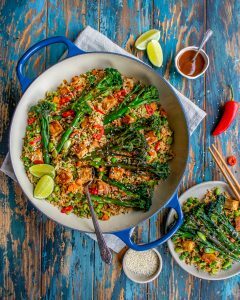 The real hero of this dish is the purple Tenderstem Royale® which is a brand new vegetable recently launched exclusively in M&S. Tenderstem Royale® is part of the brassica family and has a more buttery flavour and a gorgeous purple colour compared to his Tenderstem® cousin. It’s super easy to cook, it requires no prep time and it works so well in many different dishes. 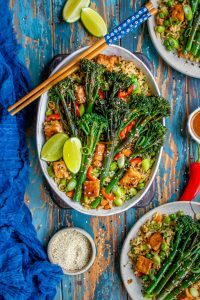 I personally love using in stir fries, any asian inspired dishes (like this fried rice) or even with pasta and casseroles. Tenderstem Royale® is also a powerhouse of goodness! It’s high in fibre and a source of potassium, vitamin A, B6, which contributes to the reduction of tiredness and fatigue and a source of folate, especially important during pregnancy. Tenderstem Royale® is also high in vitamin C, perfect to boost our immune system during the winter months! 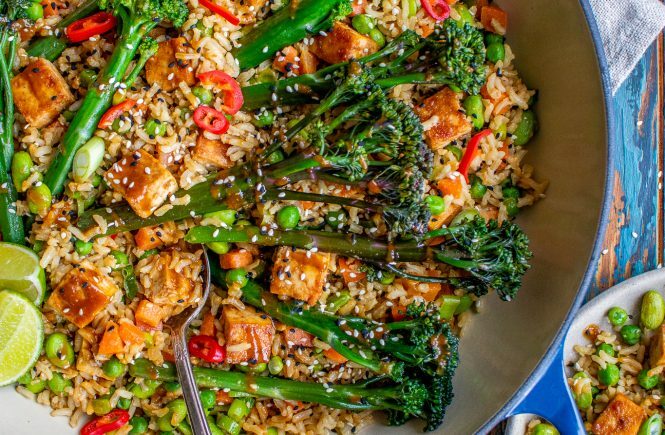 This easy stir fry is a super delicious way to boost your veggie intake and it’s great for packed lunches too! I love how the peanut sauce brings all the element of this dish together and adds that nutty and salty flavour. I also love to use it as a salad dressing! It’s just so delicious! Start by cooking the rice according to the packet instructions. Once cooked, drain it and leave it to one side. While the rice cooks, prepare the tofu. Slice the tofu into cubes and place them on a baking tray covered with some parchment paper. Bake the tofu in the oven at 180 degrees Celsius for 20 minutes or until the edges are slightly brown. While the tofu bakes make the sauce. Simple mix everything together until you have a smooth and silky consistency. Remove the tofu from the oven and pour half of the sauce on it. Give it a good shake to make sure all the pieces are evenly coated. Tip the tofu into a large non-stick frying pan and cook for about 5 minutes. Remove the tofu from the pan and leave it onto one side. In the same pan add in the Tenderstem Royale®. You want to make sure the pan is really hot. Toss them around for few seconds then add a dash of boiling water and cover with a lid. Cook for 2-3 minutes until “al dente”. Now, if you want your Tendestem® with a bit of bite, remove them from the pan and place them into a bowl to be added back in later. If you like them softer, leave them in the pan and add in the chopped carrot, peas, edamame, crushed garlic and spring onions. Add a drizzle of soy sauce and keep cooking for another 2-3 minutes. Add in the cooked rice. Put the lid back on and cook for another 5 minutes. At this point add back in the tofu, the Tenderstem Royale® (if you have removed them), the remaining sauce and mix everything together. Serve while still warm with some extra spring onion slices, fresh chilli, sesame seeds and a slice of lime.